Brownells and Henry Repeating Arms are working together to give one lucky winner a pair of Henry firearms and an unforgettable trip and range day experience. Brownells & Henry team up to give away two Henry firearms and a trip to Brownells to one lucky winner. Brownells and Henry Repeating Arms are working together to give one lucky winner a pair of personalized guns and an all-expenses-paid trip for two for an unforgettable experience at Brownells in Grinnell, Iowa. 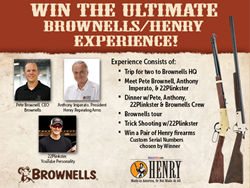 The Ultimate Brownells/Henry Repeating Arms Experience Giveaway includes travel for two to Brownells for a personal tour and an afternoon at the range learning trick shots from the one and only YouTube icon and trick shooter “22Plinkster.” That evening, the winner and guest will dine with Henry Repeating Arms President Anthony Imperato, Brownells CEO Pete Brownell and 22 Plinkster. Additionally, the winner will receive a pair of Henry firearms – a rimfire Henry Golden Boy rifle and a Henry Single Shot Shotgun – both to be engraved with a custom serial number of the winner’s choosing. Together, the guns are valued at nearly $1,200. Contestants can sign up at the Ultimate Brownells/Henry Rifles Experience page starting August 15, and the winner will be drawn on September 1. Full contest rules can be viewed on the contest webpage.